Radier fans finally had a reason to celebrate Sunday. Sebastian Janikowski kicked five field goals, Darren McFadden rushed for 110 yards and the Raiders shut out the Chiefs 15-0 in Oakland Sunday afternoon. It was the just the second time ever that the Raiders were able to blank the Chiefs. 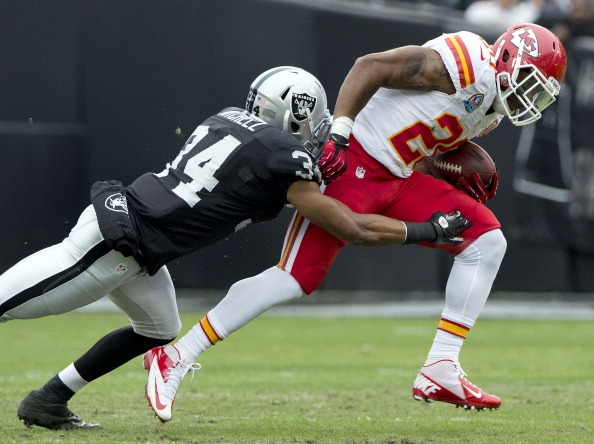 The Raiders (4-10) overwhelmed the undermanned Chiefs (2-12) to snap a six-game losing streak. Sandwiched around those losses are two wins over Kansas City, a rare bright spot in this disappointing season in Oakland. Carson Palmer finished 18-of-29 for 182 yards for the Raiders, while Rod Streater posted 62 yards on five receptions. “I thought they were totally focused in on what we needed to do and how we needed to play to win this football game,” Allen said. Sunday marked the first time the Raiders blanked the Chiefs in Oakland since a 24-0 decision on Dec. 28, 2002, while also avenging Kansas City’s 28-0 win there on Oct. 23, 2011. The Raiders defense held their foes to seven first downs and 119 yards of total offense, while rolling to 385 yards and 21 first downs. Sunday the Raiders play at the Panthers and Cam Newton. The raiders D seemed to be on the same page the whole way. Gutsy performance. I wish our WR’s and CP3 could get on the same page. What is the problem?